A 54-year-old carpenter presented to the dermatology clinic for evaluation of a lesion on his right forehead that turned out to be benign. He also mentioned that his barber brought to his attention some thick furrows he has in his scalp. These had developed slowly over the past decade or so. 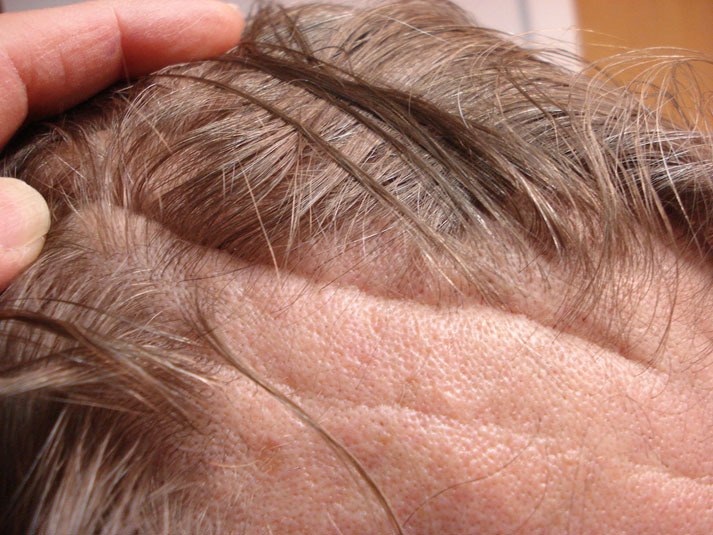 Examination of his scalp shows deep furrows consistent with a diagnosis of cutis verticis gyrata . The patient, after searching the Web, had arrived at the same diagnosis. Since cutis verticis gyrata (CVG) can be associated with acromegaly, I asked the patient about changing hat size, hand size, etc. He says that over the past 10 or 15 years, his hands have gotten significantly bigger, an observation he had assumed was due to his manual occupation. It is remarkable that someone with no medical training could make the diagnosis of CVG using tools that are free to all and this suggests that a systemic evaluation of the implements available may assist interested members of the public to help themselves, their families and care providers to get better and safer care. The Pew Research Center recently reported that people ”are turning to the internet frequently for health information. About six-in-ten (59%) [Americans] say they did so in the past year (2012). How should an akamai individual begin her search for reliable, relevant medical information? What guidelines can help one to get reliable, unbiased material? The sources utilized should not be selling anything. Can one really trust a site sponsored by the pharmaceutical industry? Many disease organizations receive grants from industry, and these, too, are suspect. How can one shun sites that have a conflict of interest. Free Full-Text Open Access (definition) pages are favored. The National Library of Medicine provides PubMed free, but only ~ 10% of its 21 million (and growing) citations are FFTOA. It can be frustrating to find a relevant article only to learn that one needs to purchase it for as much as $30 from the publisher. Pew Internet Health Online 2013. Quality Criteria for Health-related Websites. This entry was posted in Elpern, David J. and tagged health information, Internet, medical informatics, medical literature, searching by humanemedicine. Bookmark the permalink.